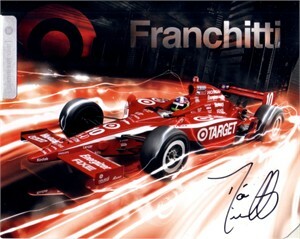 Roughly 7x9 inch Target Ganassi racing photo card autographed by superstar IRL driver Dario Franchitti, a two-time Indy 500 winner. With certificate of authenticity from AutographsForSale.com. ONLY ONE AVAILABLE FOR SALE.